Sophie and Hannah are now friends after a successful introduction. What can I possibly say about Ingrid and Fundamentally Feline? Ingrid is an absolute asset to the Atlanta community. The story I have has a happy ending, at which one time I didn’t believe it would be. Over the summer, my friend told me about a cat that needed a good home. 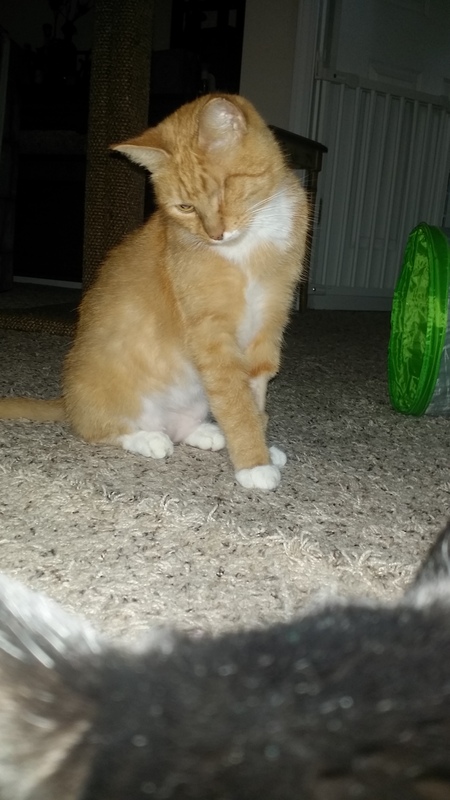 The cat was FIV+ and was missing one eye. 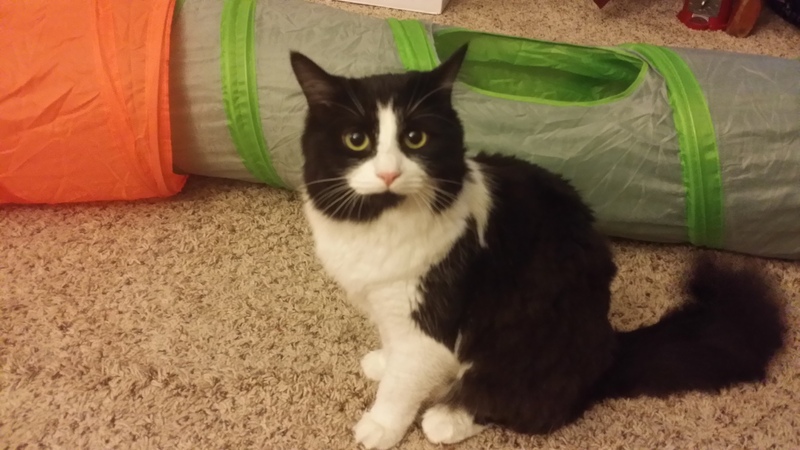 I already had one cat, Sophie – a rescue cat (FIV+ = but may not be because she was tested very young), but had contemplated adding another one. She knew I had attempted to adopt 2 prior cats where one had been abused and another that the owner couldn’t keep. But, at the time, I was weary because I was going to be moving in a few months. I relented and told my friend to pass on my contact information. I told the owner that I would be willing to take the cat on a trial basis. 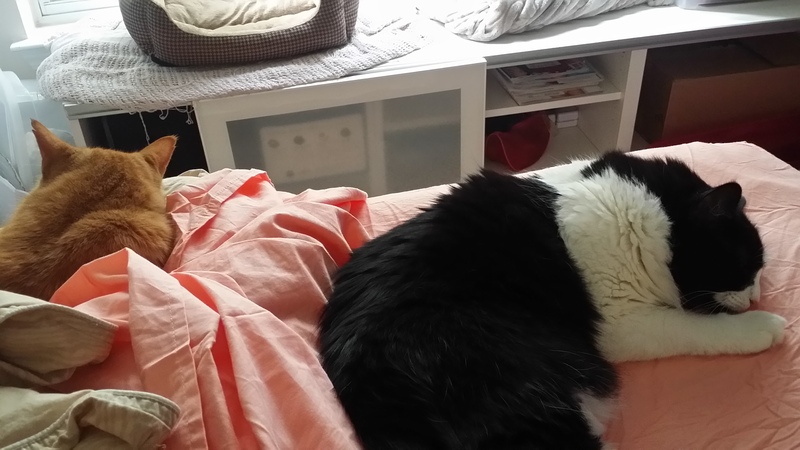 I tried to do as much homework on my own prior to the acquisition of the new cat regarding introducing a new cat into a home with an existing cat, but received such conflicting information I didn’t know what to do. When I received the cat, it went downhill from there. The previous owner didn’t divulge all the information to me regarding the new cat. The new cat had a nervous habit of licking herself because she was housed in the owner’s bathroom for almost 10 months. The owner had seven other cats and didn’t allow the cat to play with them for fear of passing FIV onto the other cats. When she arrived she didn’t look as well as I hoped. She had patches of fur missing (nervous licking) and had bite marks from fleas. But, I took her inside and I tried to get Sophie and the new cat acquainted. Sophie did not like the new cat and would growl and hiss at her, which of course made the other cat return the favor. After a week of it not working out, I tried to return the cat back to the owner. The old owner was reluctant to take her back because she wasn’t in the position to take care of her. I was very upset – I had been bamboozled. I will admit I started to resent the new cat. I didn’t feel a connection to her and regretted taking her end. My friend received quite a few emails, texts, and phone calls from me regarding my displeasure. After attempting to find a home for the cat, I contacted Ingrid at Fundamentally Feline to request a consultation. Before she even arrived, she told me about things I could do until she could properly instruct me on what to do. When she arrived, it was like an army had finally arrived to provide me with help. I was able to be very open and honest with Ingrid about how I was feeling and other issues I had with Sophie (aggressive playing). I won’t go into details but I learned so much about play time, feeding, high-quality food, and ways to keep them entertained and occupied. 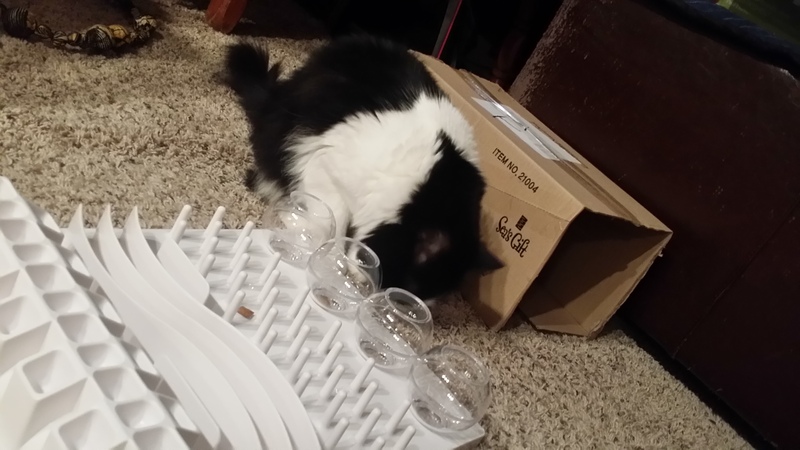 She brought some wonderful toys and cat furniture that my apartment desperately needed. After a wonderful consultation, I was on my own again. Armed with this new information I began the task of properly introducing the cats. 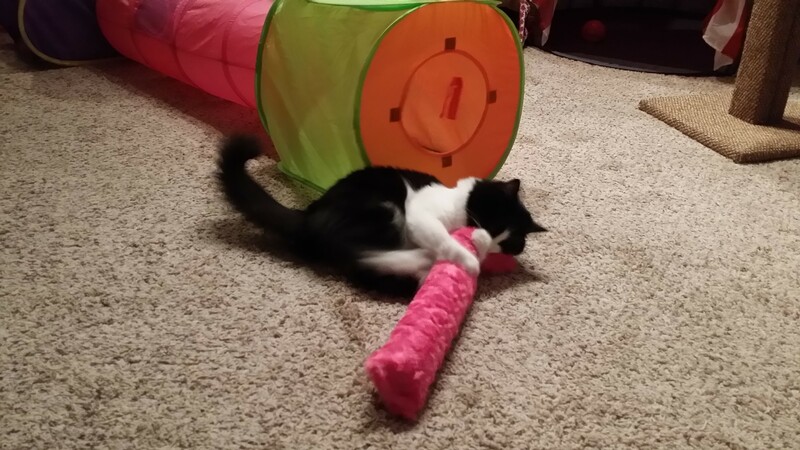 Sophie playing with catnip kick pillow. Sophie with her cat tunnels. The first thing I needed to do was have a name for the new cat and I settled on Hannah. Introducing Hannah and Sophie was no easy tasks. It required a lot of work on my end and sometimes I felt that I was never doing the right thing. I had to be patient. But, luckily I wasn’t alone. I continued to write/speak with Ingrid who reassured me that I was doing the right thing. After about 4 weeks of following Ingrid’s order she told me it was time to let them out together and play. I thought, “Is this woman nuts?” That evening I was walking on eggshells and my heart was beating out of my chest. 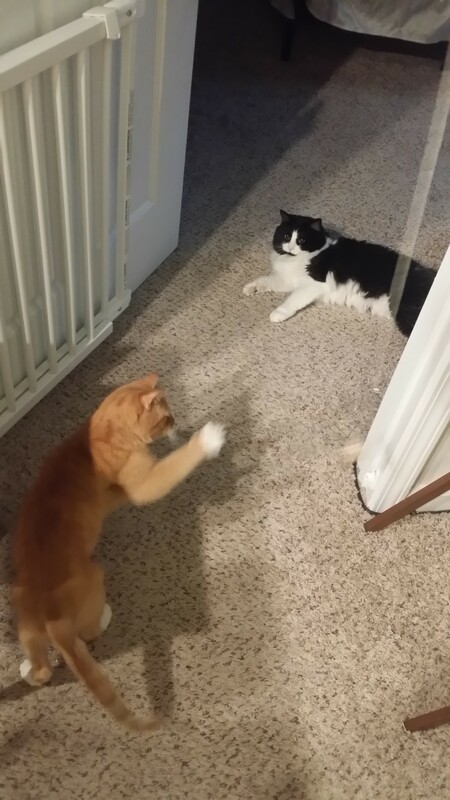 Eventually, I realized the problem was me and not with my cats and I let them play. I vividly remember that night because I felt I was chaperoning a sleepover. Hannah and Sophie played for hours. I couldn’t believe it. It worked. All my hard work had paid off. Over the next week, I continued to keep Hannah up while I was away at work, or when I was gone for a long time, but eventually it wasn’t needed. Fast forward a few months later and Hannah is a permanent member of my family. I had to stay with my parents for a few weeks in-between moving and Hannah was an angel, she even found a new boyfriend in my dad. My parents, who aren’t keen on animals, allowed Hannah to sleep in their bed (jealous!!!). Now, in the new home, Hannah is much more comfortable with change and that helps Sophie was her confidence, as she is more cautious. 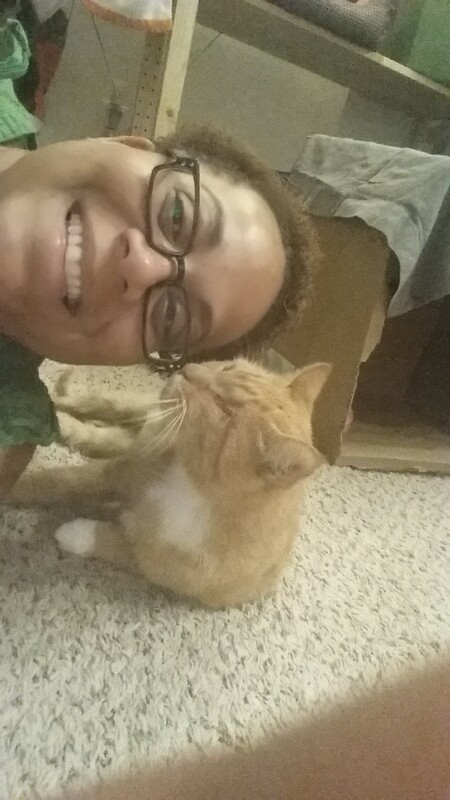 As you can tell from my story, Ingrid is not just a cat behaviorist she is a cat savior. Approximately 1.4 million cats are euthanized each year. She has kept one more (if not many more) housed in good loving homes. I understand how difficult it can be at times to stick with the regime but it works. In addition, I encourage everyone to learn more about the facts regarding adopting FIV+ cats. I learned from Ingrid (and through reading research studies) that the rate of transmission from FIV+ to FIV- cats is very low (almost unheard of). If you are thinking of getting a cat, consider a cat that is hard to place – in my case, FIV+, older, a little scrappy, and missing one eye. I hope my story encourages you to contact Ingrid if you are having issues with your cat and can’t figure out what to do. It was worth every penny as we are now a happy trio. Hannah and Sophie playing a game together! Hannah-she's a pirate! And precious. Hannah with her new mom! Loved and happy.